War has hit Shanghai. 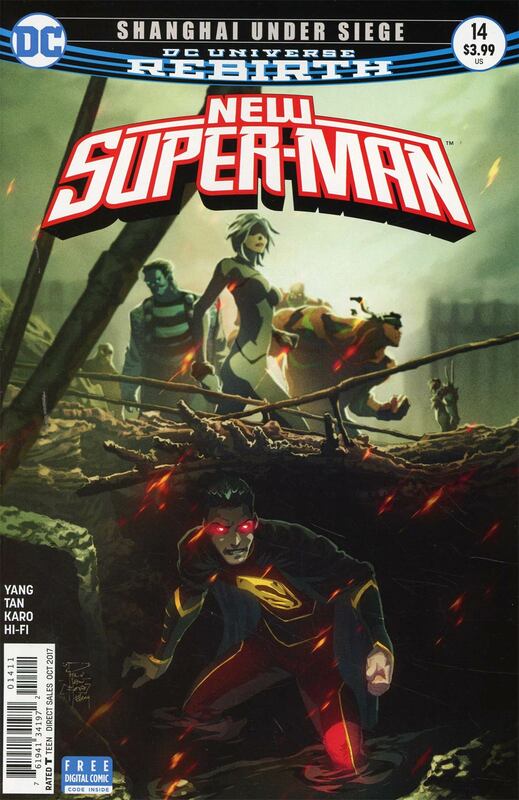 The Great Ten try to subdue Emperor Super-Man while the JLC tend to the citizens in danger on the ground. Super-Man, Flash, I-Ching, and Bat-Man find Wonder-Woman still in her snake form. Flash helps Deilan return to her human form using a grounding technique that Barry Allen showed her a while back. The technique consists of listing simple things that the person loves. Deilan is almost entirely successful, leaving her in a half-human, half-snake form. Elsewhere, the Suicide Squad receive orders from Amanda Waller to move in on the action. The JLC arrive at the Fortress of Sovereignty - formerly Shanghai Tower. Still in the tower, Mingming manages to get a message through to RobinBot and sends the team the building's schematics. As Kenan devises a plan, Master I-Ching begins feeling immense mental anguish, forcing him to sit and meditate to visit the space between spaces. There, he is attacked by a reflection of himself. Flash and Super-Man run up the building and make an entrance on the 98th floor. After subduing some guards, the two work their way down, freeing hostages as they go. While scaling the tower, Bat-Man and Wonder-Woman come under attack by the Freedom Fighters. Wonder-Woman takes a non-lethal hit to protect Bat-Man. Super-Man and Flash enter the scene. Baixi then reveals his feelings for Deilan and the two kiss, which reverts Deilan back to her human form. Meanwhile, Kenan tracks down his parents, breaking both of them free and summoning a means of escape. Before Kenan can leave, he hears screams and is encouraged to help by his father. The screams were coming from the battle between The Great Ten and Emperor Super-Man's army. Kenan comes in and takes Emperor Super-Man by surprise, but is then hit by a massive blast of heat vision. Refusing to surrender and lose everything he's gained, Kenan fights back, unlocking his heat vision power in the process. Suddenly, he becomes weakened as he sees a blade pierce Emperor Super-Man from behind. The Suicide Squad, equipped with a kryptonite sword, have arrived and they've been ordered to take out both Super-Men. Yang took the time to let the audience into the world of these characters. Everything in the story is organic. The only thing I'm not too crazy about is the Suicide Squad showing up. They've just been making their rounds in the DCU lately. Even then, it isn't like Waller and Harley weren't in this title before. Art - 4: I still really like Billy Tan's work. It just works for this book. There are some panels where characters will look a bit goofy, but the rest is so strong that it distracts from the weaker points. 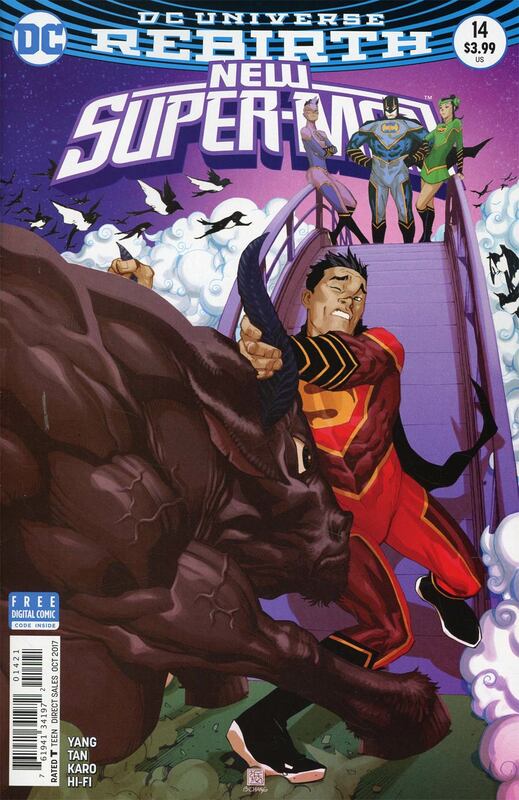 Cover Art - 1: Well, DC had Superman go through his "angry eyes of anger" phase; guess it's Super-Man's turn. This cover just doesn't work for me. I have a feeling the covers have gotten more "Look how cool this book is!" over the past few issues to try and grab new readers. As much as I love this book, I know that it will never bring in the numbers that any top-tier DC property will. The covers for the past few months seem to be a last-ditch effort to gain new readers. At least I hope that's what's going on.